Grooveshark's iPhone application launched around Aug. 11, when Vishal Agarwala, its director of marketing and business development, wrote on Twitter that Apple had approved it. But just five days later, Apple sent Grooveshark a letter regarding the complaint. Grooveshark, which competes with other streaming services such as Spotify, received a letter from Apple saying that Universal Music Group UK had complained and that its mobile application will be withdrawn from the iTunes Store, according to Grooveshark's blog. "This comes as an absolute surprise to us, and we are not sleeping until we figure out exactly how to fix this and get Grooveshark for iPhone back in the App Store," according to Grooveshark's blog. "Above all, our biggest concern is damaging the service we provide to all of you guys -- our loyal (awesome) users. " Those users who did manage to download Grooveshark in the five-day window will find the application still works. "If you've already downloaded the app, keep enjoying it," Grooveshark said on its blog. The focus of the complaint is not clear but music from the label -- whose roster includes artists such as crooner Amy Winehouse, rapper 50 Cent and Bon Jovi -- was still widely available on Grooveshark's website. Grooveshark maintains that it is "our policy to honor all takedown requests that comply with the requirements of the Digital Millennium Copyright Act (DMCA) and other applicable intellectual property laws." As far as its relationship with the music industry, Grooveshark says it has an "artists/label program to ensure that any owner of content will be compensated fairly for each time their content is played." 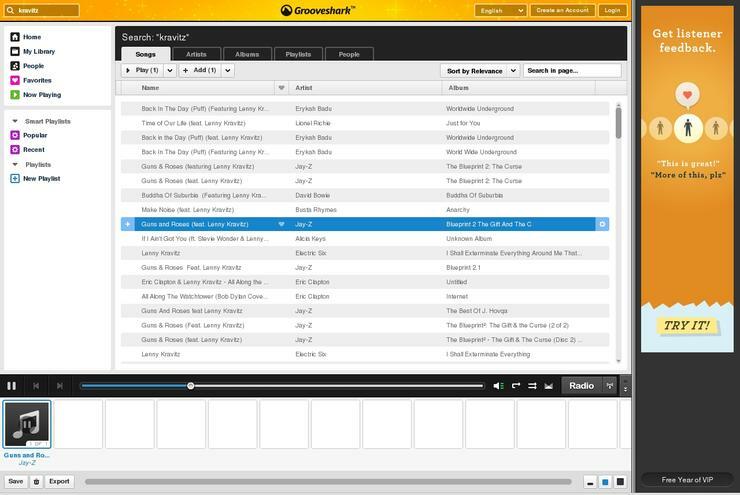 Grooveshark lets people stream music, and create and share playlists from its website. It lets users upload songs to its service, allowing people to have access to their music collection wherever they have an Internet connection. Grooveshark comes from Escape Media Group, a 40-person company based in Gainesville, Florida. Grooveshark's initial business model was to let people sell their music collection to other people. Perhaps unsurprisingly, Grooveshark has since dumped that model in favor of a more Spotify-like arrangement, where users can stream music for free with advertisements. An ad-free subscription costs US$3 a month or $30 a year, and users get other benefits such as the use of its mobile applications for platforms including BlackBerry, Android, the Palm WebOS and Symbian. Universal Music Group UK officials in London did not have an immediate comment on Wednesday morning.